The DHT test measures the DHT blood level. What is a DHT test? The DHT blood test measures the DHT blood level. Why is a DHT blood test important? This DHT test checks for dihydrotestosterone as a cause for acne, baldness and other symptoms. This DHT Test is a blood test. The DHT test, also known as a DHT lab test, DHT blood test, DHT hormone test and dihydrotestosterone test, measures the DHT blood level. DHT is a steroid hormone that is formed from testosterone through a special chemical reaction in certain tissues in the body. Approximately 5% of available testosterone irreversibly converts into DHT, creating a powerful hormone with a much stronger affinity to androgen receptors. Functionally, DHT plays a role throughout one's lifetime. In a fetus, DHT plays a vital role in the formation of male reproductive organs and this function continues through puberty. Elevated DHT levels can lead to some undesirable effects in the body. High DHT levels can increase acne, cause hair loss on parts of the body excluding the scalp and increase the size of the prostate. On the scalp, high dihydrotestosterone levels are implicated in male pattern hair loss and baldness. DHT testing is often performed with testosterone total & free testing when evaluating these types of conditions. To get a DHT test near you, just order online and get your blood drawn at the selected Quest Diagnostics lab location. Once your DHT lab results are ready, they will be available for download. 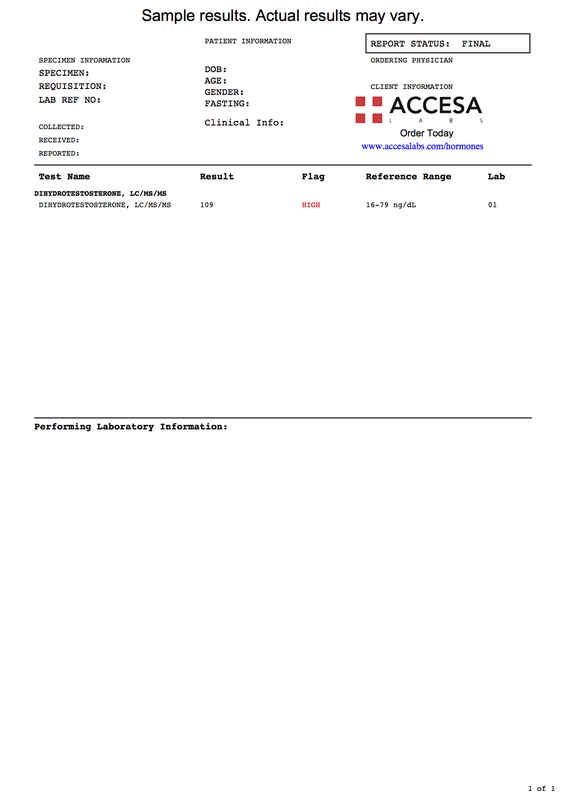 As can be seen on the sample DHT lab report above, the DHT blood level is reported as a numerical value and can be compared against the reference range provided by the lab. DHT Test at Guaranteed Prices.